Tóka G. Party Positions. In: van Deth JW, editor. Comparative Politics: The Problem of Equivalence. London: ECPR Press; 2013. p. 180-204. (ECPR Classics reprint edition). Tóka G, Popescu M. News Media Partisanship in a Cross-National Perspective. In: “Parties and Partisans: Explaining Continuity and Change in Party Systems” conference at the Juan March Institute, Madrid, Spain, 8-9 February 2013.; 2013. Tóka G, Popescu M, Millard F. The Impact of Preference Voting Systems on Women’s Representation and the Legitimation of Quota-based Nomination Results. In: Joint Sessions of Workshops of the European Consortium for Political Research in Mainz, Germany, 11-16 March 2013.; 2013. Sanders D, Tóka G. Is Anyone Listening? Mass and Elite Opinion Cueing in the EU. Electoral Studies. 2013;32(1):13-25. 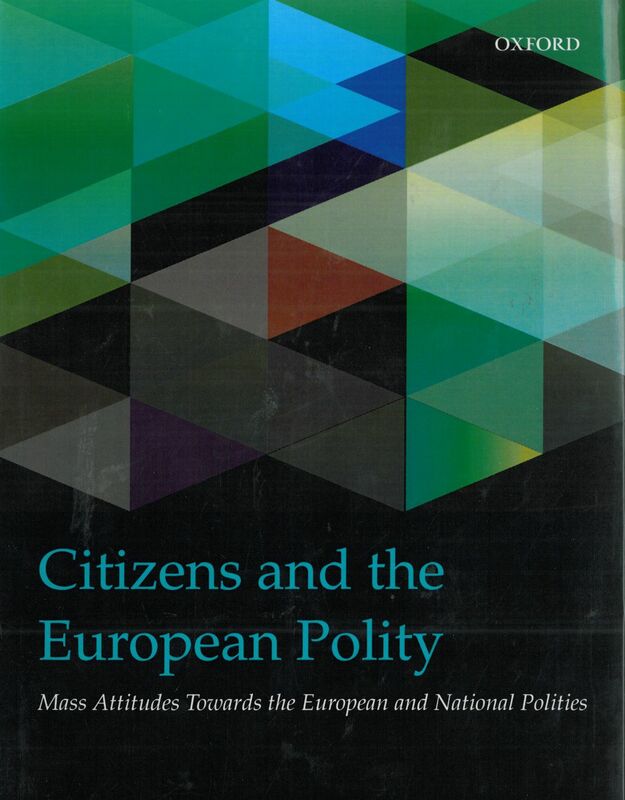 Magalhaes P, Sanders D, Tóka G. Introduction: Citizens and the European Polity. In: Sanders D, Magalhaes P, Tóka G, editors. 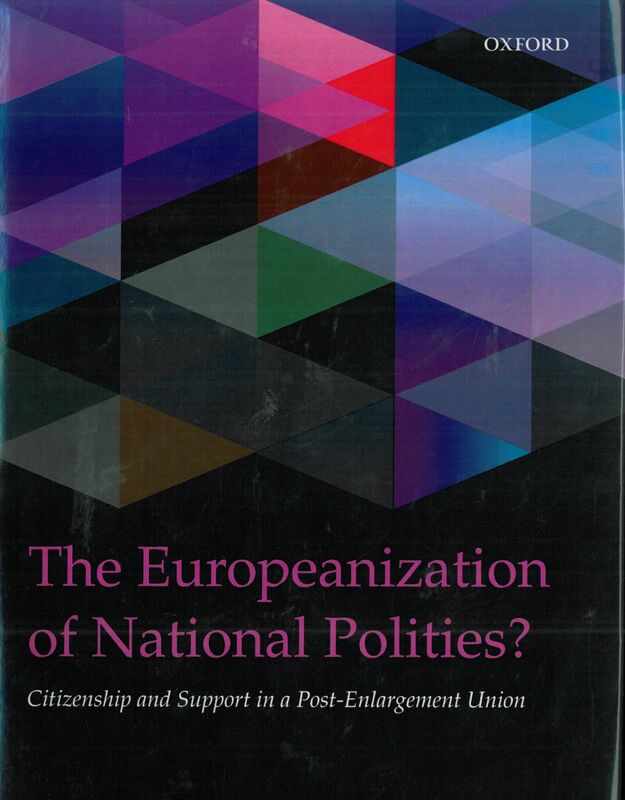 Citizens and the European Polity. Mass Attitudes Towards the European and National Polities. Oxford: Oxford University Press; 2012. p. 1-9. Henjak A, Tóka G, Sanders D. Support for European Integration. In: Sanders D, Magalhaes P, Tóka G, editors. Citizens and the European Polity. Mass Attitudes Towards the European and National Polities. Oxford: Oxford University Press; 2012. p. 169-212. Sanders D, Magalhaes P, Tóka G. Summary and Conclusions: Europe in Equilibrium - Unresponsive Inertia or Vibrant Resilience? In: Sanders D, Magalhaes P, Tóka G, editors. Citizens and the European Polity. Mass Attitudes Towards the European and National Polities. Oxford: Oxford University Press; 2012. p. 245-70. Tóka G, Csonka A. A koalíciókötések kapcsolatrendszere a ’90-es években . In: Kmetty Z, Koltai J, editors. Változó képletek, változatos perspektívák – Tanulmánykötet Tardos Róbert 65. születésnapjára [Changing Equations, Varied Perspectives – Festschrift for Robert Tardos]. Budapest: Háttér Kiadó; 2012. p. 234-50. Tóka G, Popescu M. How Do Media Systems Influence Citizens’ Political Knowledge and the Social Inequalities of Knowledge?. In: Joint Sessions of Workshops of the European Consortium for Political Research in Antwerp, Belgium, 10-15 April 2012.; 2012. Tóka G, Popescu M. Cross-National Patterns in Political Bias in European News Media. In: Joint Sessions of Workshops of the European Consortium for Political Research in Antwerp, Belgium, 10-15 April 2012.; 2012. Tóka G, Bor A. Az új parlamenti választókerületi beosztás és a politikai semlegesség [The New Districting Plan for Parliamentary Elections and the Principle of Political Neutrality]. In: Annual Conference of the Hungarian Political Science Association in Veszprém, Hungary, 21-22 June 2012.; 2012. Tóka G, D. B. Party-Voter Linkages and the Type of Democracy: Do Majoritarian Institutions Dampen the Ideological Vote?. In: 69th Midwest Political Science Association annual meeting, March 31-April 3, 2011, Chicago, IL. ; 2011. Tóka G, Popescu M, Millard F. Should Women Push for Fewer Women Candidates? Preference Voting Systems and Gender Representation. In: American Political Science Association Annual Meeting, Seattle, WA, 1-4 September 2011.; 2011. Tóka G. The Impact of Everyday Political Talk on Political Knowledge and Voting Correctly. In: Ikeda K, Morales L, Wolf MR, editors. Political Discussion in Modern Democracies: A Comparative Perspective. London: Routledge; 2010. The Impact of Everyday Political Talk on Political Knowledge and Voting Correctly. Tóka G, Popescu M, Popa S. The Influence of Democratic Institutions on the Impact of Political Sophistication. In: Joint Session of Workshops of the European Consortium for Political Research, Munster, Germany, 22-26 March 2010.; 2010. Tóka G, D. B. Prospective Proximity-based Voting and the Type of Democracy. In: 68th Midwest Political Science Association annual meeting, April 22 - 25, 2010, Chicago, IL. ; 2010. Tóka G. Expressive versus Instrumental Motivation of Turnout, Partisanship and Political Learning. In: Klingemann H-D, editor. The Comparative Study of Electoral Systems. Oxford: Oxford University Press; 2009. p. 269-88.
van der Brug W, Franklin M, Popescu M, Tóka G. Towards a European Electorate. One Electorate or Many? In: Thomassen J, editor. The Legitimacy of the European Union After Enlargement. Oxford: Oxford University Press; 2009. p. 65-92. Popescu M, Tóka G. Public Television, Private Television and Citizens’ Political Knowledge. ; 2009. Paper prepared for presentation at the 2009 EPCR Joint Sessions of Workshops in Lisbon, Portugal, 15-19 April 2009. Tóka G. Socio-economic Divides in the Shadow of Cultural Opposition: Hungary, 1990-2006.”. In: EQUALSOC FP6 Network of Excellence, Oxford, UK. ; 2009. Tóka G, Henjak A. Institutional Design and Voting Behavior in East Central Europe: A Cross-National Comparison of the Impact of Leaders, Partisanship, Performance Evaluations and Ideology on the Vote.. In: 21st World Congress of the International Political Science Association, Santiago, Chile, 12-16 July 2009.; 2009. Tóka G. A jó kormányzat, az ismeretgazdag választóközönség, és a tömegtájékoztatási rendszer összefüggései nemzetközi összehasonlításban. Politikatudományi szemle. 2009;19(2):7-26. Tóka G, Popescu M, for Studies EU. Public Television, Private Television and Citizens’ Political Knowledge. Vol 2009/66. Florence: European University I; 2009. Popescu M, Tóka G. Districting and Redistricting in Eastern and Central Europe: Regulations and Practices. In: Handley L, Grofman B, editors. Redistricting in comparative perspective. Oxford: Oxford University Press; 2008. p. 251-64. Tóka G, Popescu M. The Impact of Media and Party Systems on the Making of Informed Election Outcomes. ; 2008. Paper prepared for presentation at the annual meeting of the Canadian Political Science Association, Vancouver, British Columbia, 4-6 June 2008.Also presented at the 58th Annual Conference of the International Communication Association, Montreal, Quebec, 22-26 May 2008. Winner of the Best Paper in Political Communication Award. Tóka G. Citizen Information, Election Outcomes and Good Governance. Electoral Studies. 2008;27(1):31-44. This paper provides a new empirical test of the common sense proposition that a better informed electorate helps producing greater collective welfare. The innovation lies in an arguably more adequate measurement of both the independent and the dependent variable than those found in previous studies. The data come from the cross-national post-election surveys of the Comparative Study of Electoral Systems (CSES) project plusWorld Bank data on the quality of governance across the globe. The findings show some significant effects of citizens ability to emulate fully informed choices on the quality of governance after the elections in question. However, the effect only materializes over multiple elections, and may not extend to all aspects of good governance. van der Brug W, Franklin M, Tóka G. One Electorate or Many? Voting Behavior in New and Established Democracies in Europe. Electoral Studies. 2008;27(4):589-600. We investigate differences in the factors influencing citizens’ votes between elections conducted in established and new democracies using data collected at the 2004 European Parliament elections, comparing 7 former communist countries with 13 established democracies. Despite contrary expectations in some of the extant literature, voters in ‘new’ democracies make their political choices in ways that are very similar to the decision processes found in more established democracies. The only systematic difference is that voters in post-communist countries are somewhat less likely to make use of ideological location as a cue to the policy orientations of political parties. Perhaps in compensation, somewhat greater relative use in those countries is made of cues from social structure (particularly religion) and from issues. Tóka G. Information Effects on Vote Choices in European Elections. In: Marsh M, Mikhaylov S, editors. European elections after Eastern enlargement : preliminary results from the European election study 2004. Mannheim: CONNEX; 2007. p. 141-79. Paper from the academic workshop held May 11-13, 2006 in Lisbon, Portugal. Tóka G, Henjak A. Party Systems and Voting Behaviour in the Visegrad Countries 15 Years After the Transition. In: Saradin P, Bradova E, editors. Visegrad votes : parliamentary elections 2005-2006. Olomuc: Palacky University; 2007. p. 210-44. Tóka G, Popescu M. Inequalities of Political Influence in New Democracies. International journal of sociology. 2007;37(4):67-93. We examine two sources of political inequalities that seem inevitable in elections, supposedly the most egalitarian and most fundamental of modern democratic processes. The first stems from the fact that not everyone is equally likely to vote, and the second from unequal political information levels, which may make some groups of citizens better able than others to express their political preferences in the vote. We use survey data from two economically less advanced new democracies to empirically assess the degree to which inequalities of turnout and political information level may influence election outcomes. Our statistical analysis relies on simulation methods developed by Bartels (1996) and Citrin, Schickler, and Sides (2003). For the first time in the literature, we provide separate estimates of how equally large increases in everyone's knowledge and how a complete equalization of knowledge level across social groups may affect election outcomes. Our results show that election outcomes in Romania and Moldova may be a little different if citizens were much better informed. However, we find no change in the outcomes as a result of an equalization of turnout and information level across social groups. Thus, elections in the two countries aggregate citizen preferences probably imperfectly, but in a definitely egalitarian way. A 2004. évi európai parlamenti választások : pártok és szavazói magatartás nemzetközi összehasonlításban. Tóka G, Batory A, editors. Budapest: Demokrácia Kutatások Magyar Központja Közhasznú Alapítvány; 2006. Tóka G. Vezérek csodálói : a magyar választói magatartás nemzetközi összehasonlításban. In: Karácsony G, editor. Parlamenti választás 2006 : elemzések és adatok. Budapest: Demokrácia Kutatások Magyar Központja Alapítvány; 2006. 17=57. van der Brug W, Franklin M, Tóka G. Egységes vagy nemzetekre tagolt választóközönség? Szavazói magatartás Európa új és régebbi demokráciáiban. In: Tóka G, Bátory Á, editors. A 2004. évi európai parlamenti választások : pártok és szavazói magatartás nemzetközi összehasonlításban. Budapest: Demokrácia Kutatások Magyar Központja Alapítvány; 2006. p. 273-91. Tóka G. Values and the Legacy of Communism: Comparisons between Eastern and Western Mass Publics. ; 2006. Paper presented at the 38th National Convention of the American Association for the Advancement of Slavic Studies, Washington, DC, 16-19 November 2006. Tóka G. Political Knowledge and Voter Inequality. ; 2006. Paper presented at the Department of Political Science, New York University, NY, 13 November 2006. Tóka G. The Functions of Political Discussion and its Impact on Political Awareness. ; 2006. Tóka G. Elections and Representation. Developments in European Politics. 2006:117-35. Tóka G. East-West Value Differences in the European Union and the Legacy of Communism. Madrid: Universidad Autonoma Madrid, Dept. of Political Science and International Relations; 2005. Tóka G. Hungary. In: Berglund S, editor. The handbook of political change in Eastern Europe. Cheltenham: Edward Elgar; 2004. p. 289-336. Tóka G. The Impact of Turnout on Election Outcomes in a Cross-national Perspective. ; 2004. Paper presented at the panel on Comparative European Political Behavior at the 14th International Conference of Europeanists organized by the Council for European Studies in Chicago, IL, 11-13 March 2004. Tóka G. Can Voters be Equal? A Cross-National Analysis, 2. Review of sociology of the Hungarian Sociological Association. 2004;10(1):45-67. Tóka G. Szavazói magatartás. In: Gallai S, Török G, editors. Politika és politikatudomány. Budapest: Aula; 2003. p. 457-77. Tóka G. The Impact of Cross-Cutting Cleavages on Citizens’ Political Involvement. ; 2003. Paper presented at the 2003 Annual Meeting of the American Political Science Association at Philadelphia, 27-31 August 2003. Tóka G. The Impact of Cleavage Mobilization on Citizens’ Political Involvement. ; 2003. Paper presented at the Joint Sessions of Workshops of the European Consortium for Political Research at Edinburgh, 28 March – 2 April 2003. Tóka G, Popescu M. Media Effects in Campaigns in Elections in East Central Europe..; 2003. Media Effects in Campaigns in Elections in East Central Europe. Paper presented at the 8th International Conference of the Italian Election Studies Association, Venice International University, Italy, 18-20 December 2003. Tóka G, Popescu M. Campaign Effects in East Central Europe: Examples from Recent Elections. ; 2003. Tóka G. Can Voters be Equal? A Cross-National Analysis, 1. Review of sociology of the Hungarian Sociological Association. 2003;9(2):51-72. Also presented at the Comparative Study of Electoral Systems Plenary Conference at the Aronsborg Conference Center, Stockholm, Sweden, 2-4 October 2003. The state of local democracy in Central Europe. Soós G, Tóka G, Wright G, editors. Budapest: LGI; 2002. Popescu M, Tóka G. Campaign Effects and Media Monopoly : The 1994 and 1998 Parliamentary Elections in Hungary. In: Farrell DM, Schmitt-Beck R, editors. Do political campaigns matter? : Campaign effects in elections and referendums. London: Routledge; 2002. p. 58-75. Tóka G. Issue Voting and Party Systems in Central and Eastern Europe. In: Fuchs D, Klingemann HD, editors. Bürger und Demokratie in Ost und West : Studien zur politischen Kultur und zum politischen Prozess. Wiesbaden: Westdeutscher Verlag; 2002. p. 169-85. Tóka G. Ekonomické hlasovanie: prehl’ad literatúry. In: Verejná mienka a ekonomické reformy. Bratislava: INEKO; 2002. p. 66-73. Tóka G. Negative Information and Citizens’ Political Involvement. ; 2002. Paper prepared for presentation at the ECPR Joint Sessions of Workshops at Turin, Italy, 22-27 March 2002. Popescu M, Tóka G. Befolyásolja-e a szavazókat a Magyar Televízió kormánypárti propagandája? Egy empírikus kutatás 1994-98-ból. Médiakutató. 2002;6:21-38. Tóka G. Pártimázsok Magyarországon, 1999-2002. Magyarország politikai évkönyve. 2002;15:1540-58. Tóka G. Választási közvélemény-kutatások és előrejelzések 1998. Marketing & management. 2002;36(1):27-39. Tóka G. Voter Inequality, Turnout and Information Effects in a Cross-National Perspective. Notre Dame, Ind. : University of Notre Dame; 2002. Tóka G. A szavazói magatartás kutatása. Politikatudományi szemle. 2001;10(3):105-30. Tóka G. Electoral Research in Hungary. In: Klingemann H-D, Mochmann E, Newton K, editors. Elections in Central and Eastern Europe : the first wave. Berlin: Sigma; 2000. p. 71-104. Tóka G. Politikai ismeretszint és választói magatartás: Magyarországon nemzetközi összehasonlításban. In: Kolosi T, Tóth IG, editors. Társadalmi riport 2000. Budapest: TARKI; 2000. p. 573-90. Tóka G. Do Some Party Systems Make Equal Votes Unequal? A Comparison of Old and New Democracies..; 2000. Do Some Party Systems Make Equal Votes Unequal? A Comparison of Old and New Democracies. Karácsony G, Tóka G. A politikai közvélemény a Medián kutatásainak tükrében. Magyarország politikai évkönyve. 2000:710-35. Tóka G. Parties and Social Divisions : A Common East Central European Pattern? In: Andorka R, editor. A society transformed : Hungary in time-space perspective. Budapest: CEU Press; 1999. p. 155-78. Tóka G. Voting behavior. In: Kolosi T, Tóth IG, editors. Social report 1998. Budapest: TARKI; 1999. p. 389-408. Tóka G. Választási közvélemény-kutatások Magyarországon, 1990-98. Magyarország politikai évkönyve. 1999:706-27. Tóka G. Party Positions. In: van Deth JW, editor. Comparative politics : the problem of equivalence. London: Routledge; 1998. p. 180-204. Tóka G. Party Appeals and Voter Loyalty in New Democracies. In: Hoffefert R, editor. Parties and democracy : party structure and party performance in old and new democracies. Oxford: Blackwell; 1998. p. 167-88. Tóka G. Hungary. In: Berglund S, editor. The handbook of political change in Eastern Europe. Cheltenham: Edward Elgar; 1998. p. 231-74. Tóka G. Választási közvélemény-kutatások és előrejelzések 1998-ban. In: Argejó E, editor. Ajelentések könyve. Budapest: Uj Mandátum; 1998. Tóka G. Választói magatartás. In: Kolosi T, Tóth IG, editors. Társadalmi riport 1998. Budapest: TÁRKI; 1998. p. 391-411. Tóka G. The Hierarchy of Issue Domains in Inter-Party Relations in East Central Europe with a Directional Model of Coalition Formation. ; 1998. Paper presented at the 94th Annual Meeting of the American Political Science Association, Boston, Massachusetts, 3-6 September 1998. Renwick A, Tóka G. East meets west? British Social Attitudes Report. 1998;15:149-71. Tóka G. Party Appeals and Voter Loyalty in New Democracies. Political Studies. 1998;46(3):589-610. Tóka G. A pártpreferernciák stabilitásának meghatározói. Századvég. 1998;(9):3-26. Tóka G. Választási közvélemény-kutatások és előrejelzések 1998-ban. Jel-kép. 1998;19(4):53-76. Tóka G. Political Parties in East Central Europe. In: Diamond L, editor. Consolidating the third wave democracies : themes and perspectives. Baltimore, Md: Johns Hopkins Univ Press; 1997. p. 93-134. Tóka G. The Mobilisation of Social Cleavages in Hungary in a Comparative Perspective. ; 1997. 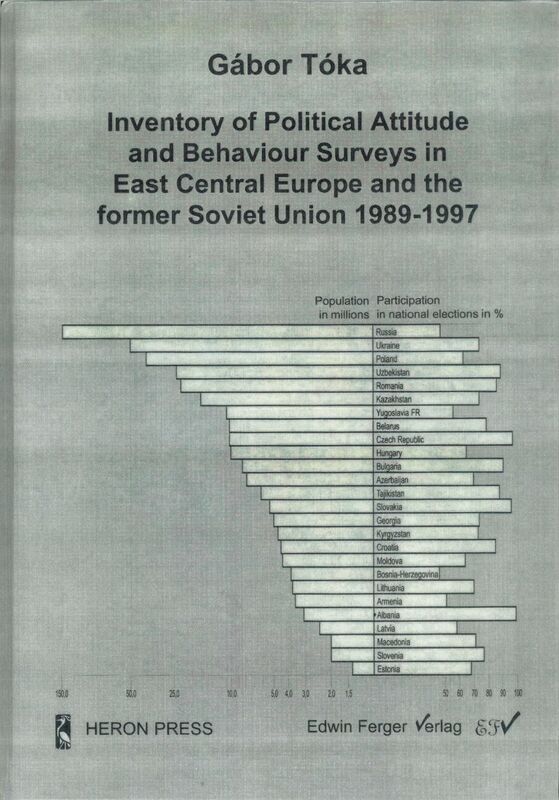 Paper presented at the international seminar on the "Evolution of Political Orientations in Post-communist Societies", Samara, Russia, 7-9 November 1997. Tóka G. Társadalmi egyenlőség a választói viselkedésben. Politikatudományi szemle. 1997;6(2):33-46. Tóka G. Strany a volby ve stredni a vychodni Evrope. Sociologicky casopis : Czech sociological review. 1997;33(1):5-26.